It’s a lesson that Peter Coppinger, the founder and CEO of the business suite at Teamwork.com, has embraced over the years as he’s grown the company into a subscription powerhouse. I talked with Peter at the SaaStock conference in Dublin about his journey as a founder, from the audacious bet responsible for the Teamwork.com brand to his strategy for succeeding with multiple product offerings. There are a ton of lessons - so¸me that have taken longer to learn than others - that Peter candidly shared with us. Let’s dive into how he made it all happen without doing it all. In 2007, Peter was searching for a project management tool for his booming consultancy. The market was still in its infancy -- Basecamp was brand new and Asana wasn’t even a glimmer in Dustin Moskovitz’s eye. When Peter didn’t find a solution, he assembled a team to build the tool he wanted. His team went all-in on tech, taking a Field of Dreams approach to product at the expense of marketing and sales. It worked well enough in the beginning: the tool shipped with some differentiating features like task templates and embedded files that propelled it to $30k in MRR. Yet, Peter felt that its brand - and awkward domain name (teamworkpm.net) -- was holding it back. On the strength of his product, Peter placed a massive bet. After a barside negotiation with a domain squatter, Peter agreed to pay $675k for the iconic domain www.teamwork.com. At the time, the company had $700k in the bank. Luckily for Peter (and his skeptical team of 12), the gamble paid off. Teamwork.com’s growth immediately accelerated, aided by a huge deal with an enterprise that had been stealthily using the product and a sales phenom that singlehandedly brought in $700k ARR in a year. As someone who had been deep in the weeds on product, Peter wasn’t initially ready to handle that runaway growth. It was only when he took a full sabbatical away from the company that he got the wake-up call: the company was in need of a CEO. Peter has always been eager to get his hands dirty. From the early days at the company onwards, he actively shipped code. At one point, he even sequestered himself in New York for six months (“a developer’s heaven”) to build Teamwork.com’s help desk product. When he returned to Ireland after his time in the states, he found a laundry list of problems had accumulated in his absence. Team members weren’t communicating. Established processes were tossed out the window. No one had been hired for six months. There was a CEO-sized hole in the company and Peter needed to fill it. After trading some responsibilities with his CTO and aligning with his leadership team on the direction of the company, Peter fundamentally changed his focus to setting strategy and managing his people. He became the CEO that Teamwork.com needed. The experience hammered a key lesson home: The CEO can’t spend all their time rowing -- they have to steer the ship. Yet, Peter couldn’t chart a single course. By this point, Teamwork.com had expanded to include a whole suite of products. It was a tremendous opportunity, but one that came with some serious tradeoffs. Let’s take a look at the benefits and drawbacks Peter encountered with multiple product offerings. From the very beginning, Peter thought the Teamwork.com brand was big enough to accommodate multiple products. After achieving success with Teamwork Projects, his team branched out into helpdesk management and live chat. The trick was getting Projects customers to use the full suite. On each product’s integrations page, there’s a one-click option to turn on the free version of another product in the suite. Allowing customers to immediately trial the product with their data is a fast-track method to make them see value. Since Teamwork.com already has a customer’s credit card on file, they don’t require them to re-enter their payment information when they opt to use another product in the suite. This reduces a lot of friction in the buying process. When a customer is clearly bought-in to one product but hasn’t tried another yet, they receive an automated email cadence encouraging them to check it out. Peter thinks the company is uniquely positioned to take advantage of the multiproduct approach. He believes that customers are gravitating toward a product suite model where customers pick a single provider for their project management, help desk, and other core business needs. In this world, the value of integration is multiplied. Yet, integration can’t be a crutch. Peter strives to make each product a market leader in its space, strong enough to stand on its own. While Peter and his team have successfully employed these strategies, they’ve run into some multiproduct stumbling blocks along the way. At ProfitWell and Price Intelligently, we know that running a company that sells more than one product has its own set of challenges. Peter has tackled some the same issues at Teamwork.com and we got to talking about his approach. The first big issue for multiproduct companies is positioning: even the big dogs like Atlassian and Zoho use a mix of company website pages and standalone websites to pitch their products. At Teamwork.com, Peter is still experimenting with his online positioning - Teamwork Desk has its own website, while Teamwork Chat does not - but he’s seen success with both sites so far. The second major challenge is keeping your teams aligned. Should each product get its own sales and marketing team? Should you mandate a single development methodology across development teams? Though Peter’s sales team is currently focused on Teamwork.com’s best selling product, he plans to create dedicated sales teams as the company expands. He’s working to align his product-based development teams to a set of best practices, hoping to avoid the duplicative work - like spinning up 90 servers when a few would do - that occurs when teams are all doing their own thing. Peter intends to continue verticalizing while making sure that his teams are talking to one another, a task easier said than done but important all the same. He's committed to uniting his dedicated teams in an environment conducive to their growth. At the end of our conversation, he shared a bit about how he brings people together and shapes the culture at the company where teamwork is the name of the game. Peter has made work-life balance a priority at Teamwork.com. When you take all the working hours in a year and subtract Teamwork.com’s generous vacation policy, sick days, and weekends, Peter says there’s about 200 productive days left. To avoid burnout, he asks his team for 37.5 hours of high quality focused work a week. When such a limited supply of productive days, each one spent away from core tasks has a huge impact (.5% of the year’s productivity). As a result, Peter is incredibly careful about pulling his team away from their work. He limits the number of offsites and is currently running a company-wide audit of all meetings, searching for ways to unlock time. He encourages his team to share their failures, preaches that great ideas can come from anywhere, and gives every new employee a box of 13 books that speak to elements of the Teamwork culture and mission. These days, Peter is focused on setting the direction of the company and empowering each of his employees to make the best use of those 200 days. As Teamwork.com has increased in size and revenue, Peter has grown as a leader and CEO. At the core of his story is a willingness to bet big on his instincts, from purchasing the company domain to becoming a multiproduct company. Each bet has paid dividends in revenue and lessons learned.At 136 employees and counting, Teamwork.com is poised to continue its incredible record of subscription success. If you want to check out more stories like this, check out our other SaaStock interviews with Kyle Porter (Co-Founder and CEO of SalesLoft) and Colin Hewitt (Co-Founder and CEO at Float) on the ProfitWell blog. 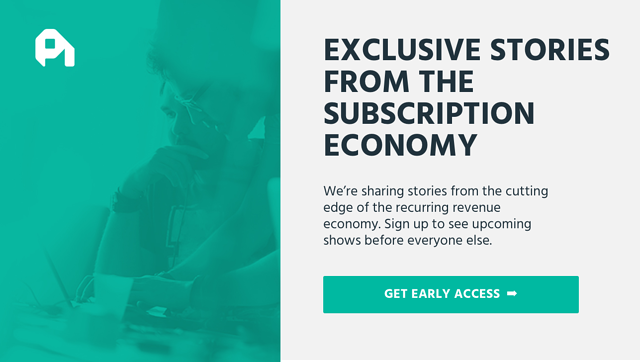 These interviews are the first part of a new effort at ProfitWell: an attempt to tell some really great stories within the subscription economy. If that sounds interesting, click here to get exclusive early access to the shows we’re going to launch next year.